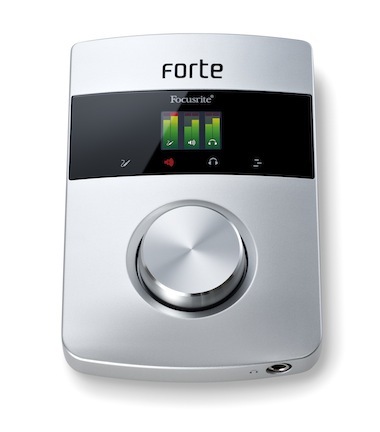 Today Focusrite unveil “Forte”, their flagship portable audio interface. Named in honour of their legendary console that virtually bankrupted the company in the 1980’s, this holds all the same quality values that they hold dear to thier hearts, but focuses on premium sound on the go. The interface’s key feature is that the Microphone preamps are taken from thier high end RedNet, ethernet based audio system, not the same ones used in the Saffire and Scarlett ranges. I was really impressed by some of the design choices for this product, the large Aluminum volume and parameter control is just the ticket to pair up with some powered monitors. Some thought has also gone into the connections, with the outputs directly on the back panel, whilst the mic and instrument connections are on a detactchable extension lead. I really am looking forward to running some tests on the A/D conversion, as the converters have 117dB and 118dB respectivel;y for the ADC and DAC. These figures are actual real-world measurements, unlike many other manufacturers, so we should be able to expect Pro-tools HD quality as a minimum. The only slight limitation is that the device cannot be powered from USB when using Phantom Power, it requires an external supply. What this tells me is that the chips (converters, Preamps, op-amps and associated circuitry) take a lot more power, which totally goes in line with the premium nature of the product and has my faith in the no-expense spared concept. I can almost hear the RME Babyface quivvering in it’s booties! I’m looking forward to putting this through it’s paces as soon as i can. • Premium two-input, four-output USB 2.0 audio interface for Mac and PC. • Best-in-class mic preamp performance with 75dB gain range (0-75dB). • Class-leading real world ADC (117dB A-weighted) and DAC (118dB A-weighted). • Colour OLED screen with motion graphics to show input and output signal levels. • Multi-function touch icons and scroll wheel with DAW control functions. • Bus-powered from USB cable (included PSU required for phantom power).